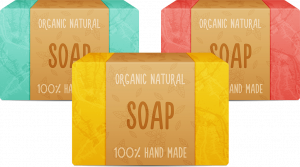 If you’re in the market for a natural and organic body wash, then you have two options to choose from: an organic shower gel (or liquid soap) or an organic soap bar. Both products, when made correctly, can be fantastic options for any skin type. Many soap bars and body washes have gotten a bad reputation over the years as being drying or harsh on the skin. The truth is, like any skin care product, the effectiveness of a soap really comes down to how the product is made. A poorly crafted body wash contains almost no moisturizing ingredients and may even contain harsh foaming agents and preservatives. An expertly crafted body wash, however, can be an incredibly hydrating and nourishing experience for your skin. So, what makes the difference? All soaps are made by combining oil or fats with a chemical called lye (all soaps are made with lye). These ingredients cause a chemical reaction called saponification (which literally means “to make soap” in Latin). Once this process is complete, if the ratio of fat to lye was correct, just soap molecules and glycerin will remain (all lye is broken down as a part of the chemical reaction). Glycerin is a humectant which helps to draw moisture into the skin. This is where the good soaps get separated from the bad. A good handmade organic soap bar, for example, is then poured into a mold and allowed to “cure” for a few weeks to allow for the excess water to evaporate. Conventional soap makers, however, will remove the glycerin from the soap and add salt to the mix in order to speed up the hardening process. They then add preservatives, foaming agents (like sodium lauryl sulfate), and other unnecessary chemicals. In summary, a great organic body wash + organic soap bar is 1) expertly crafted made with plant-derived oils + lye 2) made so that no lye remains at the end of the saponification process 3) contains naturally occurring glycerin 4) contains natural + organic ingredients 5) does not contain harsh chemicals or preservatives (such as sulfates, parabens, irritating foaming agents, phthalates, formaldehydes, oxybenzone, ethoxylated ingredients, polysorbates, phenoxyethanol, petrochemicals, triclosan, TEA/DEA, synthetic fragrances and colors). As always, we set out to find the absolute best organic body washes and organic bar soaps to make your search easier. After all of our research was completed, just 27 products met our standards for craftsmanship and ingredient quality. These natural and organic body washes are crafted by true skin care experts who clearly understand how to make a good soap. Enjoy! P.S. Want our experts to help you find the best organic & natural body wash products for your skin type? Then, try our Ox Box! It’s a seasonal subscription box filled with the best organic skin care products hand-picked for your specific skin type and skin conditions. Made with nourishing essential oils and pure organic ingredients, this totally clean organic body wash is perfect for the whole family. This body wash is free from harsh soaps and synthetic fragrances, so it's even great for babies and kids. Made with a host of fantastic ingredients like green tea, white tea, orange peel oil, cedarwood oil, patchouli, aloe, olive oil, and hydrating vegetable glycerin. Lightly lathers and leaves skin feeling soft. This organic soap bar offers a deep skin detox without drying or irritating the skin. Using a combination of bamboo charcoal, rice bran, and tea tree oil, this soap works to kill bacteria, remove dirt + oil from pores, and gently exfoliate dead skin cells. Can be used on both the body and face. Ideal for those with sensitive, acne-prone, and/or oily skin types. The scent is pleasant, but not overly feminine (great for men + women + babies). One of the purest organic body wash formulas available. This product is sulfate free, fragrance free, packed with gentle organic ingredients, and has earned a toxicity score of 0 from the Environmental Working Group. It is even packaged in a BPA-free bottle. Great for sensitive skin types including those with eczema. Also works great for kids. It has a nice foamy lather that develops quickly and really does a good job of removing dirt and oil. Osmia does two things exceptionally well: 1) they make great products for those with extremely sensitive skin and 2) they are experts at creating natural scents. This Coffee + Mint soap bar captures both of Osmia's talents. The smell of this soap bar is addictive and is ideal for early morning showers. It also softens the skin with a combination of organic ground coffee (mild exfoliation), mint, olive oil, shea butter, and rosemary extract. One of the most effective organic body washes that we tested. It goes on silky smooth, creates a light foamy lather, and leaves skin feeling absolutely clean and soft. The soap is made from a gentle castile base of organic saponified oils like olive, coconut, jojoba, and apricot oils. It is also packed with nourishing ingredients like seaweed, turmeric, vitamin C, vitamin E, borage seed oil, and lavender. Non-drying and great for men + women. This bar of soap is gentle enough for face and body use, and it is quite convenient to have a single product for the whole body. It contains all-natural ingredients and no fillers. The combination of white and pink clays gently draws out impurities without drying the skin. Geranium essential oil and blood orange essential oils give this soap a nice light scent that won't irritate sensitive skin types. Great for all skin types (especially oily). In addition to its intoxicating citrus scent, lemon verbena is also effective at softening and moisturizing the skin. This organic body wash uses lemon verbena as its star ingredient and is also packed certified organic ingredients like sunflower oil, coconut oil, aloe, orange peel, and ginger root. Has a nice lather, but you won't find any harsh chemicals, foaming agents, or irritants in this product. Handmade and crafted for all skin types. 100% Pure makes these yummy moisturizing soap bars in seven "flavors": coconut butter, peach butter, apple butter, lavender butter, mandarin butter, Meyer lemon butter, and mango butter. Each bar contains roughly the same ingredients with the exception of the specific fruit extract for each flavor. These bars are 100% natural and made with coconut oil, olive oil, rosehip seed oil, grapeseed oil, shea butter, and avocado butter. African black soap is a unique formula that has been used by West African women for hundreds of years. It traditionally contains the ash of locally harvested plants (such as plantain, cocoa pods, shea bark, etc.) which gives the soap its dark color. This take on African black soap by Sky Organics contains plantain ash, aloe, shea butter, and various organic oils (no essential oils). Highly effective for body acne and great for both men and women. Luxury organic brand Mukti really nailed it with this organic body wash. Just one pump creates a long-lasting, rich, and silky lather that will leave your skin totally clean (but not dry). The scent of lemon, lime, and citrus is very intoxicating and lightly lingers on the skin. It's like a mini-spa in your shower. This body wash is packed with certified organic ingredients like aloe, chamomile, nettles, ginkgo, safe, yarrow root, and rosemary. Dr. Bronner's is serious about soap. The family has been making soaps since 1948. This product is an all-around amazing organic soap for the entire body (and just about anything in your house that need cleaning). This formula is even gentle enough to use on delicate baby skin. It is crafted from coconut oil, palm kernel oil, olive oil, hemp oil, jojoba oil, citric acid, and vitamin E. Castile soaps should be diluted with water on a 1:2 basis. A nice soapy body wash without any harsh or toxic chemicals. Builds into a nice lather almost instantly and leaves skin feeling quite soft. It is affordable, vegan, and packed with organic ingredients like acai fruit, blackberry, rosehips, pomegranate extract, chamomile, argan oil, and pumpkin seed oil. The smell is noticeable, nutty, and pleasant without being overwhelming. Good for all skin types and makes a great body wash for men and women. Available in nine different scents like vanilla bean, blood orange, coconut, honey almond, lavender, and eucalyptus, these shower gels will transform your shower into an aromatherapy experience. Each product is packed with hydrating + nourishing ingredients like hyaluronic acid, coconut oil, green tea, and aloe. These gels are vegetarian with the exception of the blood orange, eucalyptus, pink grapefruit, and mangosteen which are vegan friendly. Another great organic and food-grade soap bar from Soapwalla. This organic soap bar gently exfoliates the skin with French green clay while adding moisture with vitamin-rich shea butter. It has a light citrus smell (from the tangerine and sweet orange essential oils) which is is very pleasant. Works well for face + body on all skin types. All of Soapwalla's products are handmade in their Brooklyn, NY studio and each bar is hand-cut to order. This organic soap from Kahina Giving Beauty is more like a body treatment than a traditional soap. The formula is crafted using a traditional Moroccan technique. It has a thick, rich, and gel-like consistency that generously coats your skin like a mask. Simply apply and leave on for about 10 minutes. This treatment really does an amazing job of softening the skin even though it is only made with organic olive oil and eucalyptus leaf oil. A surprisingly restorative organic body wash made from familiar ingredients like coconut oil, olive oil, jojoba oil, aloe, rosemary extract, lemongrass, sage, and lavender oil. It has a nice herbal scent of sage and rosemary, but it doesn't linger on the skin. It feels like applying a silky moisturizer to your skin that gently lathers as you massage it in. Rinses off clean and leaves skin feeling very hydrated. An all-around solid product. Made with 100% natural and organic ingredients, this handmade organic body wash is gentle enough for all skin types. It is made with nourishing organic ingredients like aloe, cinnamon oil, honey oil, safflower oil, coconut and sunflower oils that won't dry out your skin. Pomegranate has potent antioxidant properties which can help to reduce the signs of aging such as fine lines and wrinkles. The container is also BPA-free which is a nice bonus. An incredibly simple and gentle organic soap bar crafted by the sensitive skin experts at Osmia. It is made with 99.89% organic ingredients like olive oil, mango butter, buttermilk, vitamin E, and rosemary extract (no essential oils). Perfectly designed for those with extremely sensitive skin conditions like eczema and psoriasis. If you suffer from problematic skin and haven't found a great body wash, then look no further than this little bar. A really lovely and simple organic body wash made with just 10 ingredients (6/10 are organic). It is made by saponifying (meaning to turn into soap) nourishing oils like coconut, olive, jojoba, and hemp. This is how most truly natural soaps are made. Then, ingredients like organic aloe, vegetable glycerin, rosemary and bergamot are added to the formula. It has a very light lather and does leave a little oil on the skin. Great for dry skin types. A pure and simple organic soap bar made with just 8 certified organic ingredients (palm oil, coconut oil, olive oil, palm kernel oil, cacao butter, oat meal, aloe, and rosemary). Oat meal doesn't inherently include gluten; however, we were unable to confirm whether this soap bar is gluten free. With that said, this bar works very well on sensitive skin types--especially those with psoriasis, eczema, acne, and other easily irritated skin types. A great organic body wash that is gentle enough for all skin types (including babies and children). It has a gentle lather which doesn't dry out the skin or leaves any residue behind. Contains no water or fillers (aloe vera is the first ingredient) and no harsh chemicals. It is made with organic aloe, sunflower oil, orange oil, lemon oil, and lime oil. The only preservatives are natural radish root ferment and non-gmo citric acid. Soapwalla is a boutique organic skin care brand which specializes in creating the most gentle and effective products for those with extremely sensitive skin. This ginger and almond based body wash is made with food-grade and organic ingredients like vitamin E, coconut oil, sunflower oil, and vegetable glycerin. The most dominant smell is a sweet scent of almond (it has almost no ginger scent). It has a light lather and leaves no residue behind. This is the bar version of Sky Organic's highly rated liquid organic African black soap. It is made with the same great fragrance-free formula as the liquid soap (palm oil, cocoa butter, shea butter, plantain ash, vitamin E, and aloe) but comes in a convenient soap bar. The bar is quite large and can be cut into smaller soap bars. African black soap is highly antibacterial and works great for acne breakouts on the face or body. Naturopathica's organic body wash is made with 99.625% natural ingredients and 25.12% organic ingredients. Additionally, the entire Naturopathica skin care line is certified natural + organic by Ecocert. This body wash has a unique formula made from ingredients like Italian bergamot, orange oil, cedar wood oil, spirulina, aloe, and rosemary oil. The blend of citrus oils gives this product a nice fruity scent. Can also be used as a bubble bath. This little bar of organic goodness is the ultimate luxurious treat. It is made with 98.4% organic ingredients like buttermilk, pink clay, rose petals, coconut milk, olive oil, and shea butter. Unlike other bar soaps, this formula leaves your skin feeling very moisturized and soft (without creating a film or residue). Essential oils of orange and palmarosa leave a lovely light floral scent behind. Also, this is such a beautiful bar of soap! Plant Apothecary is an organic skin care brand that is popping up everywhere--and for good reason. This organic body wash is simple, pure, and packed with USDA certified organic ingredients. It has a light, yet totally invigorating floral + citrus scent that will have you looking forward to your next shower. The product has a silky texture (almost like honey) which creates a light lather. Made with eight ingredients and great for all skin types. 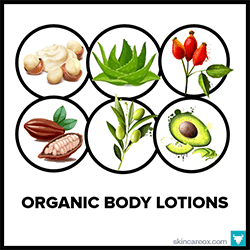 BEST ORGANIC BODY LOTIONS, BUTTERS, AND SERUMSA review of 40 awesome organic body lotions for every skin type. 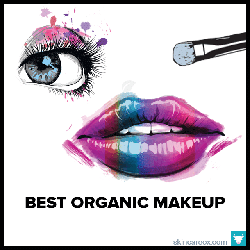 ULTIMATE LIST OF THE BEST ORGANIC MAKEUP BRANDS & PRODUCTSA sortable list of 48 of the world's best organic + natural makeup products. 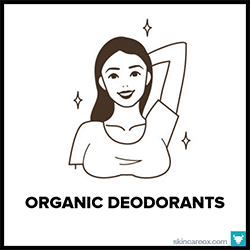 18 BEST ORGANIC DEODORANTS THAT ACTUALLY WORKA list of best 18 organic deodorants that actually work to eliminate odor and wetness. 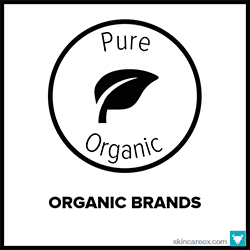 BEST ORGANIC SKIN CARE LINES: THE ULTIMATE LISTA sortable list of 69 of the world's best organic skin care lines. 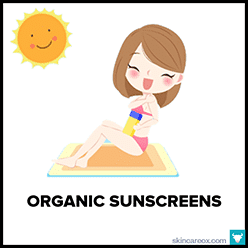 40 BEST ORGANIC SUNSCREENS OF 2018Simply the best non-toxic organic mineral sunscreens for you and your family. 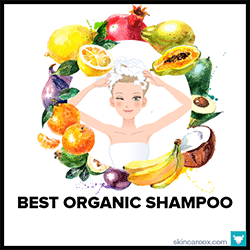 THE BEST ORGANIC SHAMPOOSThe top 27 organic shampoos that are actually non-toxic, non-irritating, and 100% natural! 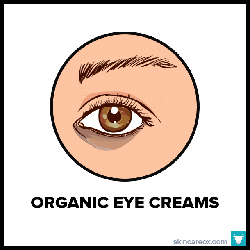 24 ORGANIC & NATURAL EYE CREAMSRejuvenate your eyes with these potent organic + natural eye creams for dark circles, puffiness, and wrinkles. 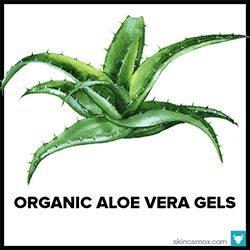 TOP 5 PUREST ORGANIC ALOE VERA GELSFive of the purest organic aloe vera gel products which contain 100%-98% pure aloe. What about the great Rosemary Mint body wash made by Annmarie skin care? I don’t see it mentioned here. It definitely deserves a place in this line up!